Petar Jankovic is lecturer in music (guitar) at the Indiana University Jacobs School of Music. He began his guitar studies at age eight in Serbia, where he later earned a degree in classical guitar from the renowned Belgrade Music Academy. While in Serbia, he won two gold medals, a silver medal, and two bronze medals at the National Music Competition. At age 16, he delivered his first professional performance, and by age 20, the Community College in Belgrade invited him to share his expertise with beginning classical guitar students. This marked the beginning of a distinguished teaching career that has developed alongside his successful performing career. He went on to earn a master’s degree from the Jacobs School of Music, and in the mid-90s, the school invited him to pursue an Artist Diploma under the guidance of Ernesto Bitetti. Still dedicated to sharing his talent through both performing and teaching, Jankovic developed a guitar program at Franklin College (Ind.) in 1997 and taught at the University of Indianapolis Music Department from 1999 to 2006. Jankovic has released five albums, the most recent two with string quartet and guitar ensemble. 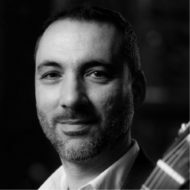 As a performer at major competitions around the globe, Jankovic’s universally evocative sound has won high regard with the world’s classical music community, and as a result, he has garnered numerous prestigious awards, including a bronze medal at the H. R. H. Princess Cristina 13th International Guitar Competition in Madrid (Spain); first prize at the First Annual Competition in Performance of Hispano-American music, Bloomington (Ind. ); a bronze medal at the M. M. Ponce international guitar competition in 1998 in Mexico City (Mexico); 1997 Graduate Top Strings Award, Indianapolis Matinee Musicale (the first guitarist to win this award), and others. Since his first professional performance in 1985, he has delighted audiences at recitals and enlightened students in master classes throughout the United States and Europe, touring both regularly, and will be touring Taiwan in November 2015. He has developed a community guitar outreach program in Serbia, currently serving 19 major cities.